Entertaining audiences worldwide, the global Nitro Circus Live tour stopped in Russia and had the hearts of extreme sports fans racing both in Moscow and in Saint Petersburg. The stars of Nitro Circus Live put on a unique and inspiring show for the Russian spectators, with bright effects from HARMAN’s Martin MAC III AirFX, provided by the rental company Euroshow, adding something extra for the spectacular performances full of power, energy and adrenaline. Professional action sports athlete Travis Pastrana founded Nitro Circus in 2009 in an attempt to unite the most fearless extreme athletes in the world. The original Nitro Circus show consisted of a variety of tricks on motocross bikes, roller skates, scooters and other vehicles like cars for dolls, toy tricycles, boogie boards for surfing, tandem scooters and many more. Some of the tricks have already achieved world record status, including the famous Nitro Bomb where 20 athletes perform backflips while floating in the air. The team includes Aaron Fotheringham who since childhood has been confined to a wheelchair. He travels the world with Nitro Circus and demonstrates how he will not allow his disability to hold him back. The Nitro Circus Live team was very clear and specific about their requirements for light, requiring wash, profile and strobes. They were only interested in 1500-W moving heads, and in line with their passion for extreme sports, wanted extreme lights. The circus arena is huge and therefore the power of fixtures became a crucial factor. 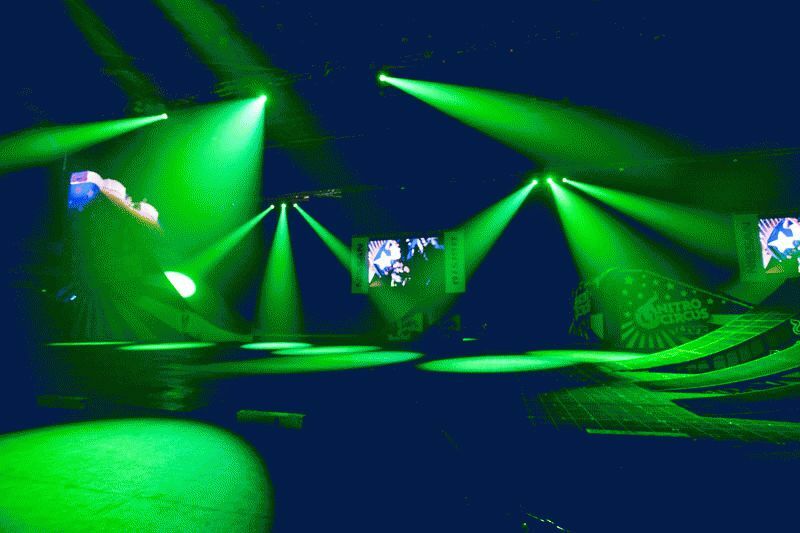 Euroshow proposed a combination of Martin Professional fixtures consisting of MAC 2000 Wash XB, MAC III AirFX and Atomic 3000 DMX. The precise and powerful effects of the MAC III AirFX appeared as a framing for the entire act. During Nitro Circus the performers risk their lives to demonstrate a truly spectacular measure of dexterity and courage. This meant added pressure and responsibility for the lighting design team.